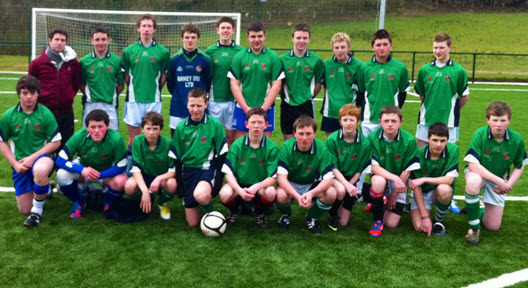 Well done to our U-16 St. Aidan’s boys Soccer team who beat Bailieborough on Tuesday 5th March on a score line of 4-2. It was a bitterly cold day on the Astroturf pitch but this seemed to have little effect on the St. Aidan's team. Even though Bailieborough scored the first goal of the match, it only made St. Aidan’s stronger and more ambitious to bring the win home. Only for some brilliant goals from Sean O’ Connor, Lee Rooney, Caoimhin Carney and Chris Mc Cabe and some spectacular saves from the Goalkeeper Enda Shalvey, St. Aidan’s wouldn’t have got the victory. St. Aidan’s played brilliantly in the second half and ran out deserving winners.